As providers of high quality metal garden furniture, we wanted to expand our range to offer the best modern garden furniture that we could find. Our stylish range of contemporary garden furniture was launched in 2017, and we are now proud to offer some superb garden tables made of lightweight yet strong, weatherproof aluminium. Our coordinating chairs in this range combine cast aluminium with a hard-wearing outdoor mesh fabric. If an extendable garden table is what you're looking for, take a look at the chic and simplistic Chloe table. This smart, functional table extends neatly to seat 6 people, and each of the chairs which you can combine with it are stackable. If you want to make your garden or patio a place where you can lay down and enjoy the sunshine (or shade), take a look at the Michelle lounger, whose aluminium frame adjusts to offer you 5 different seat positions. This sleek and comfortable lounger is available in black, grey, white and grey, and white and champagne. We even have 10 seater modern garden furniture available, in case you need to seat larger numbers. The Violet table is a fabulous example, extending from 2 to 3 metres whenever you need to seat a couple of extra guests. 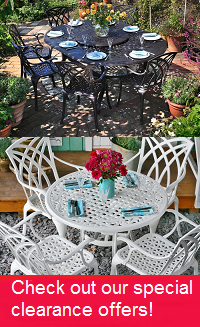 Our modern garden tables and chairs come in a range of colours including white, black, grey, and white and champagne. We also have touch up paint ready to send you upon request in the unlikely case your garden furniture needs a minor touch-up, free of charge of course. You can also request swatches for metal or fabric to help you decide which colour is right for you. As with our other ranges, our modern garden table sets come with a variety of chairs. The Lea is normally the default option, at no extra cost. Also take a look at the Milly, Georgia and Abigail chairs, with armrests and backrests in various styles, available for £10, £15 and £25 per chair respectively. All of the chairs are available in the same colours as the corresponding garden table. They are also all stackable. Underneath the main product information you can find our gift options. In this section you can find fabulous discounts of of up to 70% on complimentary products such as side tables, garden benches, seat cushions and sun loungers. Make sure you don't miss out on these special deals which are only available when combined with your main order. Lazy Susan garden furniture is made from high-quality sand-cast aluminium - the optimum all-weather, low maintenance material for outdoor furniture. Our modern garden furniture sets combine aluminium with durable outdoor mesh fabric. Unlike wrought iron, cast iron and steel, cast aluminium does not rust. Unlike teak and other wooden furniture it does not rot, warp or splinter. You don't even have to cover it up when the weather turns bad, nor sand or oil it. This makes aluminium garden furniture a smart and cost-effective choice over iron or wooden garden furniture that may only last a couple of bouts of bad weather. Your Lazy Susan furniture will not need replacing for years, and will even save you effort in maintenance, giving you more time to enjoy your garden. Even our parasol and lounger material is durable and weather resistant. Lazy Susan provides free delivery on all products, so you will not find any additional fees or service charges at checkout. Delivery preferences can also be entered by making a note in the "comments" box, and we'll pass them on to the courier. You can even track certain orders in real time on a map, and upon request receive notifications by text message to keep you up to date. If you have a question about our modern metal garden furniture, don’t hesitate to get in touch. Our friendly team is always happy to help, whether you want to chat about which products are right for you, or about the delivery procedure. You can give us a call on 01243717197, or send us an email at [email protected]. We endeavour to answer all emails within 2 hours during office hours. So go ahead and browse our range, and if you need some help don’t hesitate to get in touch.